December 9, 2016 By Aileen 2 Comments This post contains affiliate links. As an Amazon Associate and member of other affiliate programs, I earn from qualifying purchases. 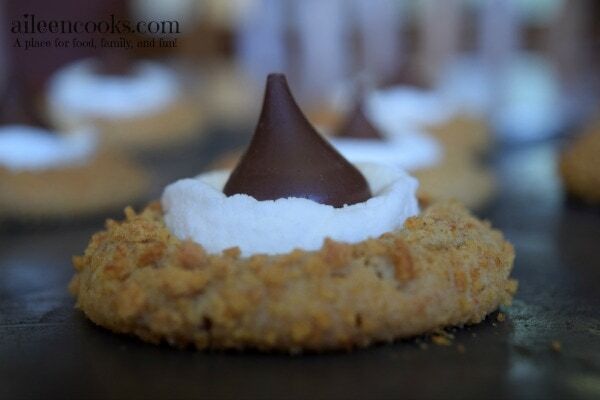 Yummy s’mores blossom cookies topped with toasted marshmallow and Hershey’s kisses. These cookies are so pretty I almost didn’t want to eat them (but we totally did). I love that they have the kisses AND marshmallows – such a fun treat. 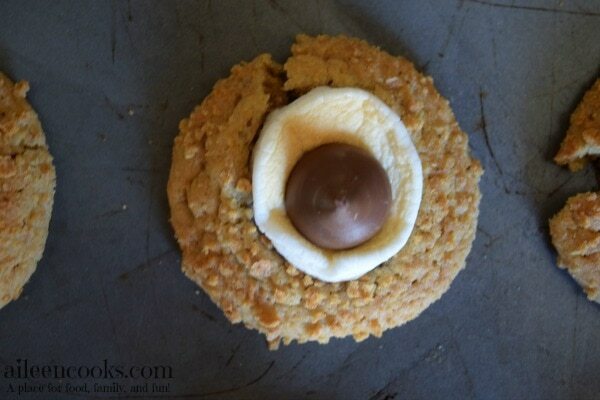 Also, if you like s’mores, you will love these s’mores brownie cups. We made these s’mores blossom cookies to deliver to our local family along with snowball cookies and chocolate butterscotch cookies. We had quite a few deliveries to make, so we needed a lot of cookies! You may also like our recipe for Grinch Christmas Cookies. Make these delicious blossom cookies rolled in graham crackers and topped with a melted marshmallow. Preheat your oven to 350 degrees. Grease two cookie sheets and set aside. In the bowl of a stand mixer or in a large bowl with a hand mixer, cream together the butter, sugars, and 3/4 cup of the graham cracker crumbs. Add in the egg and vanilla, Mix until fully combined. Mix the dry ingredients into the wet ingredients. Do not over mix. Scoop heaping tablespoons of the cookie dough and roll into balls. Roll the dough into the remaining graham cracker crumbs and place on the cookie sheets, 2 inches apart. Bake for 10-12 minutes (just one cookie sheet at a time), until the cookies just begin to crack. Remove from the oven and allow to cool slightly (1-2 minutes). Set oven to broil. 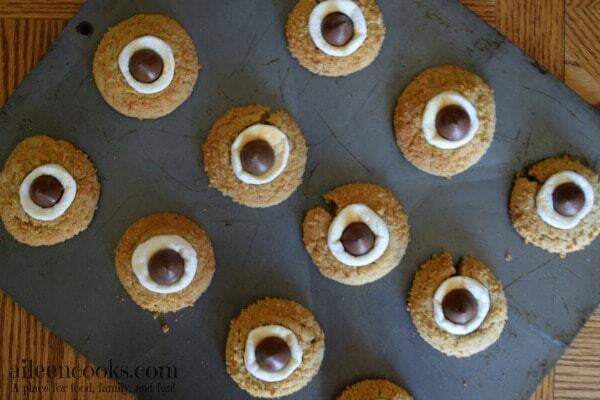 Place one marshmallow (cut side down) in the center of each cookie and push down gently so they stick. 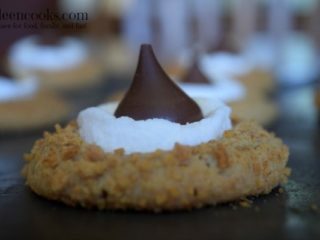 Remove cookies from the oven and immediately place 1 Hershey's kiss in the center of each marshmallow, pressing down. Allow cookies to fully cool before serving or storing.